Every year Jimmy Buffet sells out stadiums and arenas in a matter of hours. Concert-goers rant and rave that it's one of the most memorable (...and unmemorable) concerts they've ever attended. 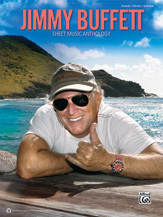 For those who want to relive the music, or those who want to remember the music of Jimmy Buffet, Alfred Publishing has released "Jimmy Buffet: The Sheet Music Anthology" arranged for piano/vocal complete with guitar chords. As always, the book is printed entirely on 100% recycled paper. Known for his time-honored song “Margaritaville,” Jimmy Buffet, along with his Coral Reefer Band, are proponents of the easy-going, “island escapism” lifestyle. Buffett’s style of music is coined “gulf and western,” which refers to the elements of his early musical influence: country and folk music, and the music styles and themes from Mexico’s Gulf Coast region. The quote that "Bands should deliver an escape from reality, an gateway to a world where nobody has anything to worry about or be angry about," is often attributed to him. Whether he said it or not, I don't know, and I don't know if Jimmy Buffet himself would know either. However, I have no doubt that he would agree. "Jimmy Buffet: The Sheet Music Anthology" is packed with 25 "Parrothead" (If you don't know, ask a Buffet fan, or better yet, go to a show) classics. The Ballad of Skip Wiley; Bama Breeze; Boat Drinks; Changes in Latitudes, Changes in Attitudes; Cheeseburger in Paradise; Come Monday; Fins; Grapefruit-Juicy Fruit; He Went to Paris; A Lot to Drink About; Margaritaville; Mele Kalikimaka; Mexico; Nobody from Nowhere; One Particular Harbour; Pencil Thin Mustache; A Pirate Looks at Forty; Rhumba Man; Scarlet Begonias; Son of a Son of a Sailor; Summerzcool; Uncle John's Band; Volcano; The Weather Is Here, Wish You Were Beautiful; and Why Don't We Get Drunk round out the list of hits in this jam-packed book. At just over 140 pages, it's got everything for the long-time fan all the way down to the Jimmy Buffet newcomer. Except for the margarita mix. That's sold separately. Information compiled from an Alfred Publishing press release.